← How to translate PDF from Spanish to English? When you need to extract tables from tiff files to CSV by command line, maybe you can have a free trial of software VeryPDF OCR to Any Converter Command Line. 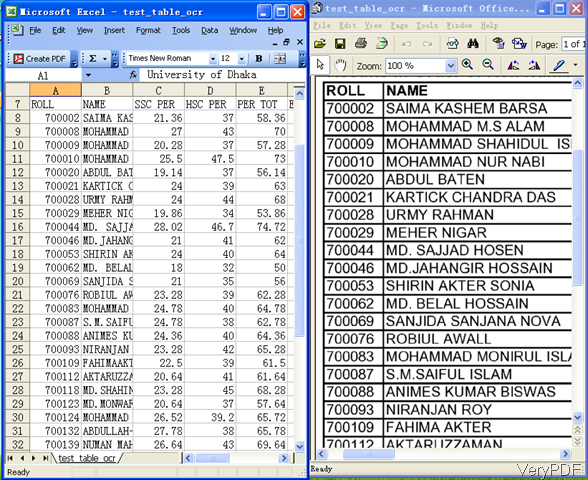 CSV would be an excellent file format for distributing this data between a number of different places. This is because CSV is very simple, elegant, and has been around for a long time. In the following part, I will show you how to convert tiff to CSV by command line. This is command line version software, once downloading finishes there will be a zip file. Please unzip it and then you can find help document, parameter list, executable file and other necessary elements in the extracted folder. If you need to check the conversion effect, please run the bat file. When you need to convert tiff file to CSV, please refer to the following command line template. By this command line, we can convert tiff file to CSV in batch by wild character. By above command line template, we can convert PDF to Excel in batch by wild character using mode 2.
for %F in (D:\temp\*.tif) do ocr2any.exe -ocr2 -ocr2autorotate "%F" "%~dpnF.csv"
This kind of command line can help you auto rotate input tiff file and then convert tiff file to CSV in bat. By this mode, you can also write bat file for automatically conversion. -ocr2:when you need to use enhanced OCR module to convert scanned PDF and image files to RTF, DOC, TXT, CSV, Excel, HTML files, please add this parameter. -ocr2aor : when you need to detect page direction and rotate it automatically, please add this parameter. And you use this parameter, please use parameter ocr2. -ocr2autorotate : this parameter has the same function as –ocr2aor. -ocr2excelmode <int> : when you need to set output Excel format when -ocr2 used, please add this parameter. This software is extremely good for extracting tables from tiff or PDF to CSV or Excel. Please check the conversion effect from the following snapshot. During the using, if you have any question, please contact us as soon as possible. This entry was posted in OCR Products and tagged command line, tiff to csv. Bookmark the permalink.